Industrial LED Electronic Counters, piece counters, box counters, unit counters, digital counters and more. Industrial LED Electronic Counters are effective tools to improve production output, throughput, efficiency, etc. These units are a low cost means of providing realtime data to factory workers when it’s needed the most. Awareness of line conditions and output data are vital to improving overall efficiency and performance. Electronic industrial counters help to improve production flow, eliminate bottle necks and waste to allow lean manufacturing at its best. 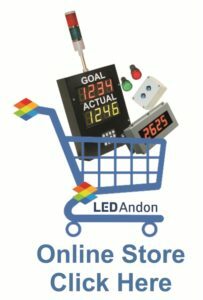 What is an LED Counter and how is it used?